Steven and Miriam Krieger think so. Needing a larger home and hoping to stay in their Arlington neighborhood, the young couple began their search in 2012. After losing bids on two houses, Steven and Miriam spotted a small house they could see from their townhouse window that was scheduled for demolition, to be replaced by a new town home development. They purchased the property and their vision for a dream home began to take shape. Steven’s experience working at the Center for New American Dream had schooled him about lifestyles that promote responsible consumption and protect the environment. Now, with his new 5,240 square feet property in hand, Krieger began the search for a builder who could accommodate his vision for a model energy efficient home. 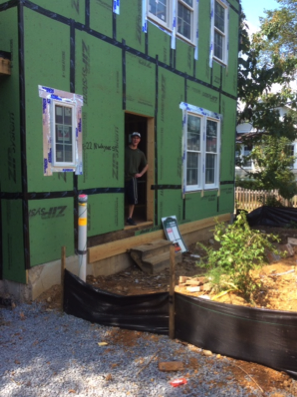 The search brought him to Andrew Moore, a local award-winning green builder of Arlington Designer Homes. Moore invited the Kriegers to an open house sponsored by Energy House, www.energyhouse.us a partnership of D.C. area companies that provide residential energy upgrades. 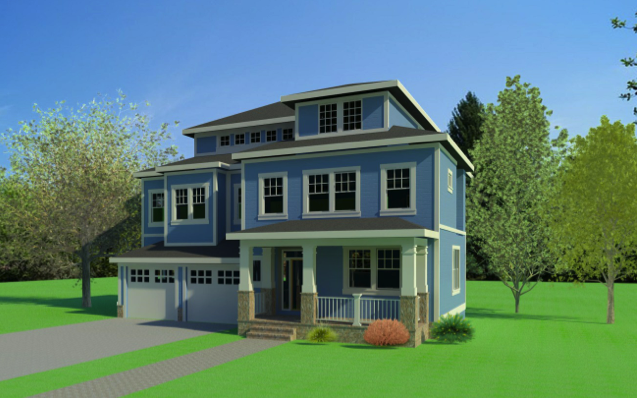 The Energy House model exposed the Kriegers to a full range of energy efficient systems applicable to the ground-up construction of their new home, a 5000 square feet, three-story house with seven bedrooms and four bathrooms. One of the first major decisions they made was to install a geothermal heating and cooling system, a more expensive choice up front for what will be a long term payoff. Kreiger concluded: “Sometimes doing the right thing cost a little more.” Estimated to be 45% more efficient than conventional systems, and with a projected pay back within 5 years, a geothermal system is also eligible for a 30% federal tax credit. 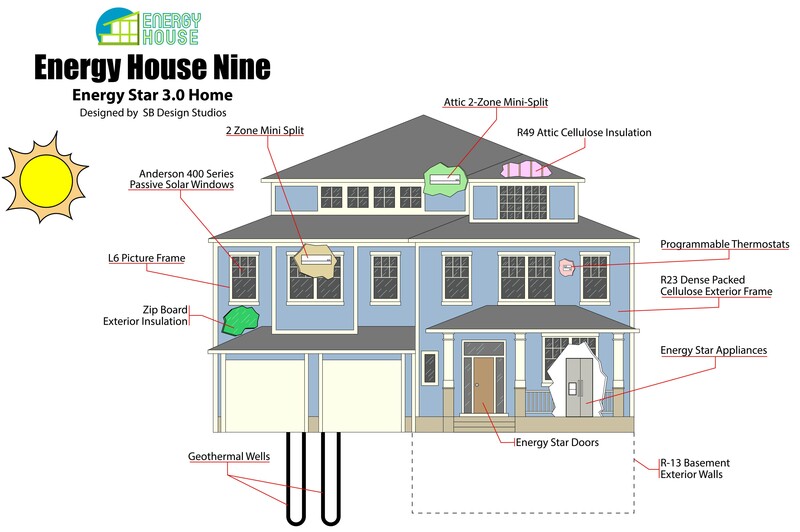 With help from the Energy House, Steven and Miriam did their homework learning about different kinds of insulation, framing, passive solar design, the Energy Star rating system http://www.energystar.gov/index.cfm?c=home.index, sustainable building products and green landscaping. An Energy Review by the Energy House experts included recommendations to meet the highest standard of energy efficiency for their property. They also engaged Deconstruction Services to disassemble and salvage materials from the old house that earned the Kriegers an additional tax credit. There were many choices to be made if they were to properly seal their home, an essential element for energy efficiency – fiberglass, cellulose, foam? It is estimated that air leakage can contribute to 30 percent of the cost of heating and cooling. The Kriegers will use a combination of foam and blown cellulose. They will also use permeable pavers for their driveway and seek the lowest VOC (volatile organic compounds) level paint for their home. VOC levels are also to be considered when selecting carpet and flooring. They discovered that reflective shingles cost twice as much as standard shingles so they’ve opted for the latter. And while the house will occupy most of the lot, they will remove the invasive species that make up the remainder of the landscape. As a result of their diligent planning, Energy House review, and monitoring, the Krieger home will also make use of the Zip System®, a structural roof and wall system with a built-in energy-efficient barrier that keeps moisture out and reduces air leakage. Use of the Energy Star rating system will ensure that the home is built to the highest standards and is used to rate doors, windows, framing, and lighting. While the Kriegers were able to make decisions as part of the original design of their new home, the energy efficient systems employed are available and adaptable to existing residences that can dramatically impact the cost of heating and cooling and provide a more comfortable home into the future.